Think military perfection, and a glossy shine on your brogues, that will make you stand out from the crowd. Your dress shoes are an investment shoe – and you need to take care of the leather. Leather is animal hide that will crack, and dry out, over time. Treat the leather with respect and you will be repaid tenfold. Keep looking your dashing best, and complete your outfit, with a well-polished dress shoe. Your dress shoes will, through normal use, develop scuff marks, and the polish and the color will fade. Leather is a natural product and will degrade over time if you don’t look after it. For example, if you have left your leather dress shoe in a damp place, there may be mold. Do I have to clean them first? Before polishing? Can’t I just wipe them with a cloth, and get on it with it? No, you can not. There are a number of shoe shine kits on the market. Prices vary greatly. Be sure to see exactly what you are getting, for the cost – kits range from $10 to $100. It is worth investing in a quality kit, as you will use it for a lifetime. The more expensive valet style kits come with both cleaning materials and polishing equipment, inside a travel case. These can be monogrammed with your initials, and are useful to have too when you travel. Generally, your shoe shine kit needs to contain: cream shoe polish, wax polish, applicators, a horsehair brush and a buffing cloth. It is a good idea to buy a leather conditioner of some kind, such as saddle soap, leather conditioner or a leather oil. Keep an old t-shirt, or some soft clothes in this kit too. Hot water and soap can be used to clean your dress shoes, or, you may need to use something a little stronger. Depending on the climate that you live in you can develop a salt build up on your leather shoes (snow). The second problem you may have is that you may have too much waxy polish on your dress shoes. If you have a buildup of wax polish it can be removed by soaking cotton balls in nail polish remover and gently wiping over the layers. Dilute two parts water, with one part of vinegar, to make an acidic solution to remove salts that have built up on the shoe. Make sure that the shoes are completely dry before applying any polish. Leave them to dry for at least 20 minutes. Where Should I Shine My Shoes? You will need to use a large space to clean your shoes. You need to work in a well-lit area so that you can see exactly how much polish you are putting on, etc. The area that you are working on needs to be protected too. Put down newspaper or an old towel. Be sure to protect your own clothes too. Polish stains! Remember to wear old clothes to do this job too. You don’t want to get polish on your laces. Do remember that polish will also stain the stitching of your shoes. Do not use a color cream polish if your stitching is a contrasting color to your dress shoe. If this the case, rather use a neutral polish. Your dress shoes need to be clean before you can polish them. Remove dust, and surface grime, that has built up. You can use your shoe cleaning brush to brush off the dirt, or, you can use a damp cloth. (Hot soapy water). Do not apply too much water to leather. Simply wipe dirt off, and assess your shoes. Are there tough stains? Or blotches of polish? If this is the case, then make either the vinegar solution or soak balls of cotton wool with nail polish remover and clean off those marks. Be gentle. Leave to dry for at least 20 minutes. Before you can apply polish to your shoes the leather needs reviving. Leather can crack, and dry out, and by feeding the leather you are extending the life of your dress shoes. 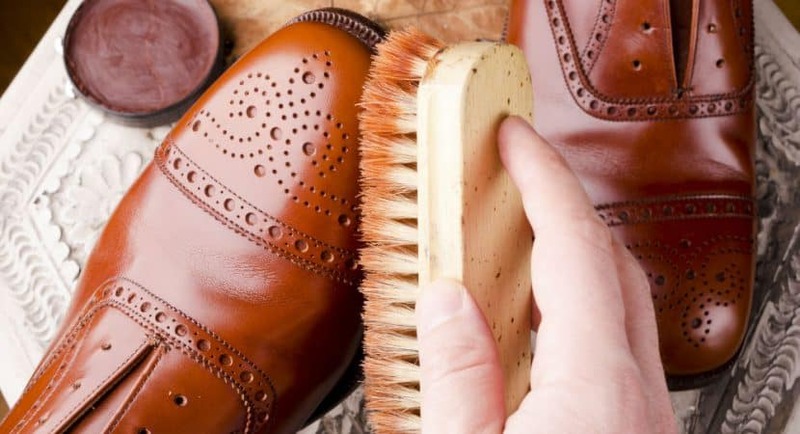 You can apply saddle soap to your dress shoes with a damp cloth. Saddle soap contains lanolin and beeswax, which will moisturize, and protect the leather. You can apply a leather conditioning product, or you can use an oil, specifically made for leather. These will help your shoes to retain their flexibility. Leave for at least 20 minutes to soak into the leather. Apply either a colored cream polish, that is the same shade as your shoes, or a neutral polish Allow to dry, and buff off with your horsehair brush. Be sure to work over your newspaper, and to use firm strokes. Once the color has settled on your dress shoes you can apply either one, or two, layers of the wax polish. Wax polish has beeswax and turpentine, and will also help to protect the leather. Use an old t-shirt, or soft cloth, to ‘wax on, wax off’, and rub with small circular movements. Buff your dress shoes with your horsehair shoe brush. They are on their way to greatness, there is one more stage. This is the ‘spit shine’ military method, that will give you the winning edge. Apply small drops of water to your dress shoes, with your finger. Just sprinkle a few drops, and use your polish cloth, to shine your shoes. Let them dry for 20 minutes. Now repeat this 3 times. Yes, three times. Leave overnight. You are nearly there. Take a soft cloth and give your dress shoes a final buff. The shine should be spectacular. Enjoy.